Published: March 29, 2013 at 03:56 p.m. Updated: April 1, 2013 at 12:03 p.m. 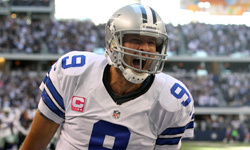 The Dallas Cowboys are taking care of quarterback Tony Romo. 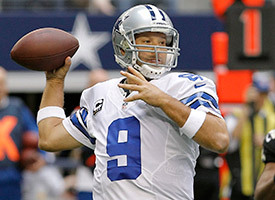 NFL.com's Ian Rapoport reported Friday that the Cowboys and Romo agreed to a six-year, $108 million contract extension with $55 million in guarantees and a $25 million signing bonus, according to the quarterback's agent, RJ Gonser. The extension goes into effect after the 2013 season, when Romo earns $11.5 million, essentially giving him a seven-year, $119.5 million contract through 2019. The deal makes Romo the highest-paid player in Cowboys history and tops the $52 million in guarantees that Joe Flacco received from the Baltimore Ravens as part of his six-year, $120.6 million pact. The Cowboys officially announced Romo's signing Friday night, with team owner Jerry Jones saying in a statement: "We are very confident in this investment and commitment." Added Romo: "Our goal is the Super Bowl, and I am determined and honored to be the guy in this position to help our team do that." Romo's new contract also gives the Cowboys more salary-cap room, which was an issue earlier this week when the team tried to sign free agents. According to NFL.com's Albert Breer, Romo's previous cap number was $16,818,835. With a $1.5 million base salary for 2013, $5 million prorated off his $25 million signing bonus and $5,818,835 due in dead money prorated off the old deal, Romo's new 2013 cap number is $11,818,835. So Dallas saves exactly $5 million on the cap. The Cowboys had been talking with Romo's camp on and off after hoping to sign the 32-year-old quarterback to an extension last summer. Take a look back at the best photos of Dallas Cowboys QB Tony Romo. As Rapoport reported Thursday, a clause in Romo's contract stipulated that the Cowboys could not franchise-tag him if no deal was reached by the end of the 2013 league year, effectively making him a free agent. That handed significant leverage to Romo, but instead of parting ways, he'll remain with the Cowboys deep into the future. Romo was set to count $16.8 million against the salary cap in 2013, but a reworked extension will allow the Cowboys to lower that figure and add additional pieces to the puzzle. For a quarterback with just one playoff win in nine seasons, every little piece will help. UPDATE: NFL.com's Albert Breer reported that $40 million of the contract is fully guaranteed. Half of that amount becomes fully guaranteed on the third day of the 2014 league year with the other half guaranteed on the third day of the 2015 league year.